Last week the Seahawks were fueled by rookie power. This week it was the veterans who stepped up huge. Doug Baldwin caught a career high 3 touchdowns and Jermaine Kearse added a pair of touchdown catches to help propel the Seahawks to a much-needed 39-30 win over the Pittsburgh Steelers. The win gives the Seahawks a 6-5 record, their first winning record of the season. It was great to see the Seahawks finally close out a close game in the fourth quarter after it looked like Pittsburgh would make a late charge. Here is what I took out of Sunday’s victory. Happy Birthday Russell: On his 27th birthday Russell Wilson went out and had the best game he could have possibly asked for. Wilson completed 21 of his 30 passes for 345 yards and 5 touchdowns. The best part? He did not turn the ball over once. Seattle’s offensive line did a tremendous job protecting Wilson. It also felt like the offensive game plan was designed to help Russell out in the pocket, meaning he may not have had as many progressions on each play which is a big factor in how long Wilson holds onto the ball. Wilson was also able to do something that has not been done all season. The Seahawks trailed two separate times in the fourth quarter and we were able to score 19 points in the final frame to re-take the lead twice and hold on to it. Our offense as a whole had played their best game of the season and could provide some serious momentum moving forward. The Good News and the Bad News: The good news is that the Seahawks finished the game +4 in the turnover department. Those four turnovers, all of which interceptions, led to three Seahawks touchdowns. As much as I want to praise the Legion of Boom for forcing these turnovers, the bad news is that the Seahawks defense gave up 480 yards through the air and 538 total yards. According to this statistical category it was the worst outing for our defense all season. A lack of a pass rush directly contributed to our defensive struggles. In my game preview I emphasized the importance of putting pressure on Ben Roethlisberger or else he would have time to make deep throws, something which he thrives on. Roethlisberger threw deep several times on Sunday including a high-arching 69-yard touchdown pass to Markus Wheaton. I think DeShawn Shead played a decent game in place of the inactive Cary Williams and it would not surprise me to see him start in Williams’s place once again next week. Graham’s Injury and Moving Forward: The Seahawks were dealt a huge blow in the fourth quarter of Sunday’s game. Russell Wilson threw a 24-yard pass to the back corner of the endzone intended for Jimmy Graham. Graham fell to the ground and immediately grabbed his right knee. After the game it was reported Graham tore his right patellar tendon, an injury that will require surgery and end his 2015 season. Many people have gotten on Graham’s case for not being the offensive machine he was in New Orleans but keep in mind that entering Sunday’s game Graham led all Seahawks receivers in receiving yards. Luke Willson will start in Graham’s place for the rest of the season and Cooper Helfet will likely see expanded playing time. As devastating this injury is I believe it is positive to stay optimistic. The Seahawks scored touchdowns on all three drives following Graham’s injury. Perhaps with Graham out some of our offensive chemistry from last season will be rediscovered. Thoughts on Pittsburgh: The Pittsburgh Steelers offense can be one of the best in the league but if they want to compete for a wild-card spot their defense must play better than they did on Sunday. Unfortunately a lot of their talent is young which may not translate to a deep playoff run. This team is good enough to make the playoffs now but I would wait a couple more years before I would consider them legitimate super bowl contenders. Random Thoughts: I was surprised that the fog did not completely burn off this afternoon. Sitting in the 300 level, I love when it is foggy because since you cannot see any surrounding buildings it feels like the stadium is in its very own cloud… There were way too many terrible towels but only a couple around me fortunately. No incidents between Steelers and Seahawks fans in my close vicinity also so that was good… Let me talk for a minute about that Steelers fake field goal/pooch punt formation/pass which was executed horribly and intercepted by Jeremy Lane. What in the world was that?! Why are you going for a fake that early in the game? A field goal would have given the Steelers a 6-0 lead but instead it led to Seattle’s first touchdown and a 7-3 Seahawks lead. Good on Lane for not biting and staying with eligible receiver Alejandro Villanueva on the outside. Worst play call I have seen from any team all season… NBA hall of famer and former SuperSonic Spencer Haywood raised the 12 flag on Sunday. I love when they honor former Sonics because it feels like they are keeping the spirit of the Sonics franchise alive… Two huge road games coming up. Two must-wins. Minnesota’s first up. Seahawks Playoff Outlook: With the Seahawks win and losses by Atlanta and Tampa Bay, the Seahawks currently hold the #6 seed in the NFC Playoffs. The Seahawks are 3 games behind the Arizona Cardinals for first place in the NFC West. What’s Next: Look for my preview of next week’s crucial game against the Minnesota Vikings on Saturday morning. On February 5th, 2006 the Seahawks played in their very first Super Bowl, Super Bowl XL in Detroit. We were the NFC champions and we faced off against the Pittsburgh Steelers. In what felt to be a Steelers home game, the Seahawks lost their first chance to win the Lombardi Trophy. Steelers 21, Seahawks 10. The game will forever be remembered for several questionable officiating gaffs which many Seahawks fans still believe may have cost us a championship. Ever since the 12’s have had a justified hatred of the Pittsburgh Steelers. On Sunday, 3,585 days later, comes the home game Seahawks fans have been waiting for ever since. The 6-4 Steelers make their first trip to CenturyLink Field since Super Bowl XL to take on the 5-5 Seattle Seahawks. Pittsburgh leads the all-time series with the Seahawks 9-8 including 21-0 and 24-0 Steelers shutouts in our last two meetings in 2007 and 2011 respectively. The last time the Seahawks scored on the Steelers was Jerramy Stevens’s touchdown in Super Bowl XL. This game could have significant playoff implications for both teams. This is what I will be watching for. If there is one thing I am always looking for from the Seahawks offense it is consistency. Running back Marshawn Lynch will not play again this week so Thomas Rawls will see the majority of the carries for the second straight week. Unlike San Francisco which sports the 27th ranked run defense in the league, Pittsburgh comes into this week’s game as the 5th best run defense. Rawls may have a difficult time getting going and I certainly do not expect him to put up the record-breaking numbers of a week ago. Note however that Rawls leads the league in yards per carry with an average of 6 YPC. If Rawls can run for at least 80 yards I believe the Seahawks will be in good shape. You cannot count on Rawls alone to carry the offense. I want to see the same type of good decision making from quarterback Russell Wilson that made our passing game wildly effective last week. In our 5 wins this season Wilson has thrown only 3 interceptions. Pittsburgh is good at forcing turnovers. So far this season the Steelers have 18 takeaways including a +5 giveaway/takeaway ratio which is tied for 6th best in the league. The Seahawks can and will win this game if Wilson takes care of the ball. During last week’s win cornerback Cary Williams was benched in favor of DeShawn Shead, who made 4 tackles and forced two fumbles. With Jeremy Lane activated from the physically unable to perform list, I believe we will see change at Williams’s spot against the Steelers. Head coach Pete Carroll said on Monday that there would be an open competition for the right cornerback job during practice this week. If Williams starts expect him to be on a short leash with Shead and Lane sharing playing time if Williams struggles. If Williams does not start altogether I expect Shead to get the nod since it is likely the Seahawks would like to ease Lane into the defensive game plan. Steelers quarterback Ben Roethlisberger averages 315 passing yards per game so the Legion of Boom will surely be tested this week. In addition, opposing quarterbacks have a 120.6 passer rating when throwing towards Cary Williams. Being able to cover deep passes will be huge, as Pittsburgh likes to throw deep. As a skilled veteran, it would be no surprise at all to see Roethlisberger test Williams, Shead, or Lane early and often. The Pittsburgh Steelers offense is a unit that has changed quite a bit over the years. The one constant is quarterback Ben Roethlisberger, who will be playing in his first career game at CenturyLink Field. My focus for the Steelers offense is how well they handle the crowd noise as well as Roethlisberger’s pass protection. The Steelers will start two offensive linemen who did not start the season with the first group. Left tackle Alejandro Villanueva will have a big test in front of him as he will line up across from Cliff Avril, who has been on fire as of late. Center Cody Wallace is a 6-year veteran who has been playing in place of Maurkice Pouncey all season. If the Seahawks can put pressure on Roethlisberger it will take away the most effective facet of his game, stepping up and throwing the deep ball. Wide receivers Antonio Brown, Martavis Bryant, and Markus Wheaton will all make a major impact this week if Roethlisberger has time to go through his progressions. Look for Big Ben to throw several deep passes on Sunday. The Steelers have lost many big names on the defensive side of the ball since the last time these two teams played. Gone are the days of Joey Porter and Troy Polamalu and the Steelers have replaced these names and more with great talent. Veterans James Harrison and William Gay have made a big impact this season, combining for 60 tackles. Rookie Bud Dupree leads all Steelers defenders in sacks with 4. I will be focused on the guy who statistically has had the best season of any defensive player. My X-Factor Player to Watch for the Steelers this week is inside linebacker Lawrence Timmons. Timmons has locked down the middle of the field for Pittsburgh since 2007 and although he is a seasoned veteran his numbers are very impressive. Timmons leads the team in tackles with 73. He can also rush the passer which could make for a long day for Seahawks linemen Justin Britt and Patrick Lewis. Timmons can also drop back into coverage. He has recorded 6 passes defensed and one interception. If Russell Wilson decides to throw short or intermediate passes expect Timmons to be in on the play. 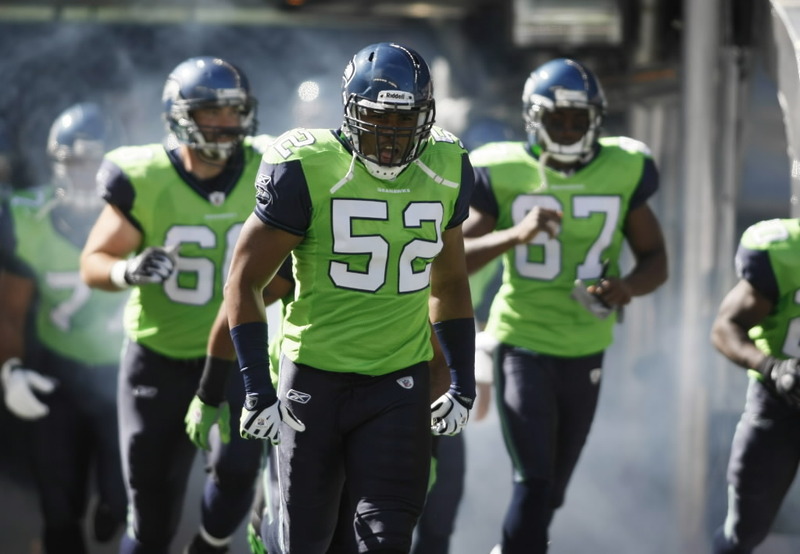 Random Thoughts: All navy once again for the Seahawks uniform wise. The Steelers will wear white jerseys and yellow pants… This is the national game of the week on CBS and the entire country except for the San Francisco Bay Area will be able to see this game on local television. Jim Nantz and Phil Simms have the call with Tracy Wolfson patrolling the sidelines… The referee will be Walt Anderson… The gameday giveaway is flags which will be distributed to the first 44,000 fans… Don’t fall asleep again this year Alan. I don’t want to see a repeat of what happened last year… I am expecting to be disappointed in regards to the number of Pittsburgh fans in attendance. Steelers fans probably travel the best of any NFL franchise… To those attending please be smart when engaging with opposing fans. I know it may be difficult to holster any trash talk towards Steelers fans given our bad blood towards their franchise… I am kind of surprised there hasn’t been any news this week bringing up Super Bowl XL and specifically what kind of ovation the Steelers will likely receive upon running out of the tunnel… I have been waiting years to have the opportunity to boo this team. I will certainly savor every second. Prediction: Expect a nerve-racking back-and-forth game. The Seahawks will have a 23-21 lead with 5 minutes left to play. Ben Roethlisberger will lead a Steelers drive deep into Seahawks territory but will have to settle for a Chris Boswell field goal. With the Steelers leading 24-23 the Seahawks will have one last opportunity to drive into field goal range to win the game. Two big gains by Thomas Rawls and a huge completion from Russell Wilson to Tyler Lockett will put Seattle inside the Pittsburgh 35-yard line. Steven Hauschka will knock through a game winning 50-yard field goal with only seconds remaining. The Seahawks will improve to 6-5 and will lock down their first winning record of the season. What a way to kick off the second half of the season. There is little doubt that this game is the biggest game of our season thus far, given the opponent and the potential implications of winning or losing. In front of a nationally televised audience the Seahawks host the NFC West leading Arizona Cardinals on NBC’s Sunday Night Football. After two straight wins heading into the bye the Seahawks sit at 4-4. The Arizona Cardinals have jumped out of the gate to a 6-2 start and hold a two game lead on Seattle for the division lead. The all-time series with the Cardinals is tied 16-16. The Seahawks have won their last two games against Arizona including a 35-6 walloping of the Cardinals in week 16 last season to take control of the NFC West lead. The Cardinals are a tough opponent and have recent history of beating the Seahawks at CenturyLink Field so this game is certainly no gimme. Here is what I will be watching for on Sunday night. The common narrative heading into this game has been the Seahawks lack of efficiency in the red zone so far this season. In our first 8 games the Seahawks have taken 18 drives into the red zone. Of those drives, half of them have resulted in field goals and only 5 have resulted in touchdowns. The last Seahawks red zone touchdown came on Marshawn Lynch’s one yard run in the first quarter against San Francisco two weeks ago. Our red zone touchdown percentage of 27.8 is the worst in the league. Seattle also only averages just over two visits to the red zone per game; also dead last in the league. The Seahawks need to capitalize on our trips deep into Arizona territory. Settling for field goals will make it tougher on us especially later on in the game. With the improving play of our offensive line, expect quarterback Russell Wilson to have more confidence throwing towards key red zone targets Jimmy Graham and Jermaine Kearse. If Marshawn Lynch can also get going to extend drives the Seahawks will be in fantastic shape. The Arizona Cardinals have a very good passing game, oftentimes using three or more receivers. On defense this week for the Seahawks I am looking at what our personnel will look like when we use nickel or dime packages, and just how often will we use at least 5 guys in the secondary. Of course the Seahawks are well known for playing a “cover 3” defense but given the talent Arizona has at the receiver position it may be necessary for DeShawn Shead or Marcus Burley to play more. Playing an extra member of the Legion of Boom may work to our advantage, especially if we can confuse Cardinals quarterback Carson Palmer in coverage. Forcing interceptions may be difficult this week though. Palmer has thrown over three times as many touchdowns as he has interceptions. Sacks may also come at a premium, as the Cardinals offensive line has done a great job protecting their quarterback. Arizona has surrendered only 11 sacks so far, an average of 1.4 sacks per game. On offense the Arizona Cardinals have two of the most explosive units in football. The signing of running back Chris Johnson has propelled the Cardinals to the 9th best rushing unit in the league. My focus this week will be on Arizona’s fourth ranked passing offense led by quarterback Carson Palmer. Arizona averages 292 passing yards per game, and 66.3 percent of Palmer’s completions have been caught by the three headed monster of Larry Fitzgerald, John Brown, and Michael Floyd. My X-Factor Player to Watch spotlight will be on Fitzgerald this week as his role is the most interesting in my eye. Fitzgerald leads all Arizona receivers in receptions, yards, and touchdowns. The majority of Fitzgerald’s time however has been spent in the slot rather than on the outside. This is where a fifth Seahawks defender will come into play; to help cover Fitzgerald in the middle of the field. Fitzgerald catching passes means the Cardinals will be moving the ball in small chunks while tiring out the Seahawks defense at the same time. Although Arizona leads the NFC West and they have good talent on the defensive side of the ball, after watching film I still consider this unit to be a “poor mans” Seahawks defense. 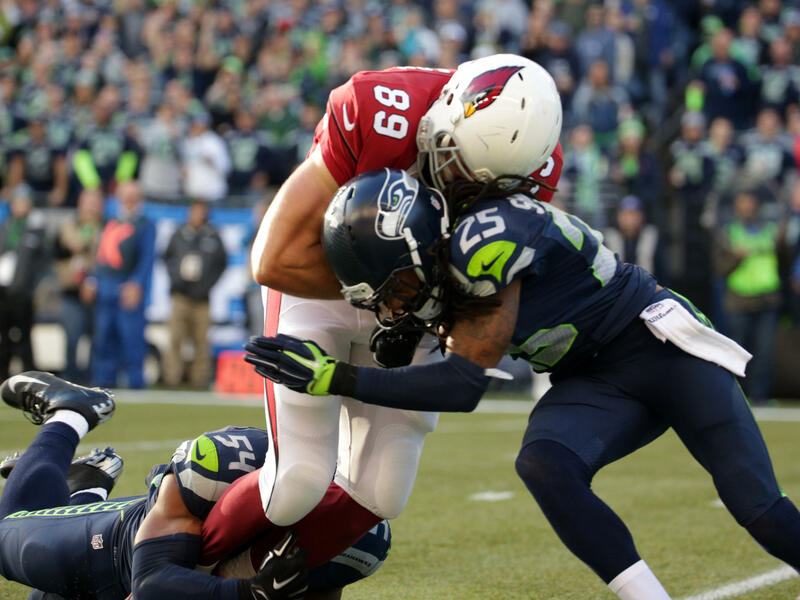 The Cardinals are using the Seahawks blueprint to create their defense and it is working. The pass rush continues to be exceptional with Calais Campbell, Frostee Rucker, and Dwight Freeney. Linebacker Kevin Minter has great range as he is the second best tackler on the team and also leads all Arizona defenders in tackles for loss. What scares me the most though is the play of the Cardinals secondary. Patrick Peterson continues to be one of the best cornerbacks in football. Tyrann Mathieu is probably their most versatile defender doing everything from rushing the passer to playing in deep coverage. If there is one defender to watch it is strong safety Deone Bucannon. In his second year out of Washington State, Bucannon has gone from reserve safety to the leading tackler on the team with 56 through their first 8 games. Bucannon is a hard hitter in coverage and also displays impressing ball-hawking skills. If the Seahawks throw deep do not be surprised to hear Bucannon’s name on the broadcast. Random Thoughts: With the aura of primetime football comes a primetime broadcast crew. Al Michaels and Cris Collinsworth have the call on NBC. Michele Tafoya will report on both teams from the sideline. The Seahawks will wear all-navy and the Cardinals will likely wear white jerseys and white pants. I highly doubt we will see Arizona break out the red pants… Clete Blakeman is this week’s referee… Ah finally; primetime football after daylight savings time. It will be dark. It will be loud. It will be the most bonkers atmosphere of the 2015 season. I cannot wait… The game theme is military appreciation. 91-year old Corporal Clayton Pitre will raise the 12 flag prior to kickoff… No bars this week since I’m taking my dad. Lunch downtown then probably either Pyramid or Safeco Field for pregame beers most likely so that should be a nice little change of pace… This game is the biggest game because of the possible ramifications. A win and the Seahawks are one game behind Arizona and our hopes of a division title remain intact. A loss means we are three games behind Arizona, they will hold the head-to-head tiebreaker, and we can virtually kiss our chances at a division title goodbye. We will be solely focused on a Wild-Card berth if we lose this game and I am not ready to turn my attention to the 5 or 6 seed. A loss is not acceptable. Prediction: In the Pete Carroll era the Seahawks are 9-0 in primetime with a combined score of 245-94. I do not expect this game to be a blowout but I also do not expect a loss at home in primetime. Russell Wilson will be sacked 4 times but will make two deep throws to set up Marshawn Lynch touchdown runs. Carson Palmer will throw for one touchdown, Chandler Catanzaro will kick a field goal and the Arizona defense will also add a safety. In the end however, Steven Hauschka will kick two fourth quarter field goals and the Seahawks will win their third straight game, improving their record to 5-4. After getting off to a turbulent start on the road in back-to-back weeks the Seahawks finally make their triumphant return home. The 2015 Seahawks home opener will take place Sunday afternoon as we take on the Chicago Bears. 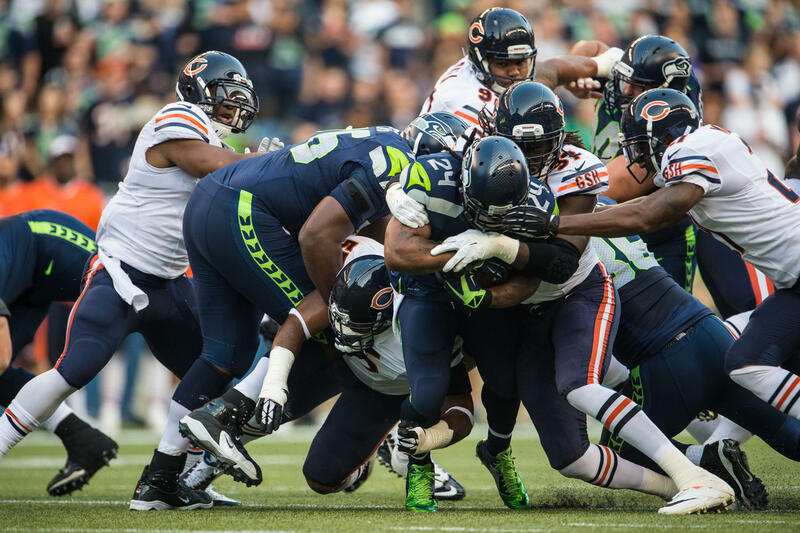 The Seahawks may be 0-2 but they are in much better shape than the 0-2 Bears. Chicago was dismantled at home last week, losing 48-23 to the Arizona Cardinals. Seattle leads the all-time series with the Bears 10-6. Our last meeting with Chicago came in December 2012. The Seahawks drove down the field 97 yards to take a late fourth quarter lead, then won the game in overtime after taking the opening series down the field for a touchdown. That win propelled the Seahawks to 4 straight wins to close the 2012 season with an 11-5 record. The winds of change have blown tremendously over the past week as both the Bears and Seahawks will look considerably different than they would have if they played each other last week. This I was I will be watching for in week 3. This week my hope is that we can get the running game back to normal. Marshawn Lunch has struggled out of the gate but this week’s matchup could give him a perfect opportunity to get back on track. The Chicago defense has allowed an average of 124 rushing yards through their first two games and they have yet to face a talent across the line of scrimmage as dominant as Lynch. In my opinion the Seahawks will be making a big mistake if they decide to throw the ball on first down. Be sure to keep track of the number of times we rush on early downs because it would not surprise me to see Lynch get between 25 to 30 carries. In the passing game the Seahawks must take advantage of the height differential between our receivers and Chicago’s secondary, in particular cornerback Kyle Fuller. Fuller is the Bears number one cornerback so he will likely be drawn to Doug Baldwin. Both of Chicago’s safeties are only 6 feet tall so it may be wise to run tight end Jimmy Graham down the middle of the field to go up against Antrel Rolle and Adrian Amos. Seattle will be in magnificent shape if we can put up between 350 and 375 total yards of offense. My main focus on defense is glaringly obvious; the return of strong safety Kam Chancellor. Our defense has not played its style of football yet this year, as we have allowed an average of 30.5 points per game. Chancellor’s return hopefully brings the “boom” back to the Legion. This is the perfect week for Chancellor to come back as the defense faces the 19th best passing offense in the league. Head coach Pete Carroll said on Wednesday that Chancellor is in incredible shape and it is his hope that he will be ready to play on Sunday. It would not surprise me to see DeShawn Shead start over Chancellor but Kam may see some playing time. With Chancellor back and possibly up to game speed there should be little to no worry in regards to the Seahawks being able to maintain a lead. Plain and simple, with Kam Chancellor back so is my complete confidence that our defense can play shutdown football. As far as skill positions go, the Chicago Bears enter this week somewhat in disarray. Wide receivers Alshon Jeffery, Eddie Royal, and Marquess Wilson are all listed on the week 3 injury report but my focus will be squarely on quarterback Jimmy Clausen. Clausen will start in place of Jay Cutler who injured his hamstring last week. With the exception of his rookie year in 2010, Clausen is a career backup who has seen limited snaps in the regular season. Clausen does however have experience playing in front of the 12’s at CenturyLink Field. He led a terrible Carolina Panthers team into town in December of 2010 and the Seahawks defeated them 31-14. In that game Clausen went 18/34 for 169 yards and one interception. This week could not have been a more unlucky draw for Clausen and the Bears offense. They will be going up against a fired up Seahawks defense. The mediocre Chicago offensive line has allowed two sacks in each of their first two games and the pressure will be on to keep Clausen clean on Sunday. Pro Bowler Kyle Long will have my eye in particular. Long made only his second career start at right tackle last week and he will be lined up there again against the Seahawks. I would not be surprised to see the Seahawks get to the quarterback at least three times. I believe it could be a very long day for Clausen this week. The talk along the Seahawks offensive line so far this season has been the terrible play of center Drew Nowak. The best chance the Bears have at making an impact on defense is to attack the middle of Seattle’s offensive line and it all starts along the defensive line, specifically at nose tackle. My X-Factor Player to Watch for the Bears is the man that will go directly against Nowak, rookie defensive tackle Eddie Goldman. Goldman has been thrusted into a starting role after the suspension of starting nose tackle Jeremiah Ratliff during the preseason. Goldman was selected in the second round of this past year’s draft but has made little impact on the field thus far. In his first two games he has combined for only 3 tackles. Upon watching Bears film Goldman seems to struggle penetrating the line of scrimmage. He does a decent job working his assignment but does not do anything overly special to be a game changer. If he has great success against the Seahawks offensive line, Nowak in particular, it may be time for the Seahawks to seriously consider a personnel change. As cool as they were at the time, well, let’s just say I’m glad we’ve done a Nike overhaul since… Hawks Nest before the game for the first time this season. See ya’ll there. Prediction: After the immense frustration of weeks prior, the Seahawks will make sure this is an absolute bloodbath. Marshawn Lynch will run for two touchdowns, Tyler Lockett will return a punt for a touchdown, and Russell Wilson will throw touchdown passes to Doug Baldwin and Jimmy Graham. The Seahawks will get their season back on the right track with a huge blowout victory.